Tinley Park---Was our first move after leaving the South Side of Chicago. Paul and I, and 3 daughters (at the time) ventured past 159th & Harlem to a new Gallagher & Henry development and built our wonderful 3 BR 2.1 bath Forester-model Home. At the time the population in 1987 was about 38,000 residents and Harlem Avenue only had 2 lanes each way. It felt like I had traveled hundreds of miles away from our beloved South side of Chicago where water and garbage were included in our taxes! Tinley Meadows was full of wonderful families that we latched on to and we enjoy those friendships to this very day! Neighborhood traditions: my husband would dress up as Big Bird and travel the neighborhood on Halloween! And Paul also coached all of our girls’ softball teams! Our block also hosted Candy Cane Lane every Christmas where all residents participated in our making of lighted candy canes and reindeer. Ahhhhh….the memories. Our children enjoyed the great Park District Day Camp and July 4th celebrations in the Park! Tinley Park now offers an amazing White Water Canyon Water Park. We have been there this year. But they do not allow strollers so Grandama (that’s me) is always welcome!!! Great Lazy River & even I ventured on the slides! To date Tinley Park has over 60,000 residents and multiple lanes on Harlem Avenue!!!! There are 3 outstanding train stations in Tinley Park. I often meet friends on Saturdays in the summer at the Oak Park Avenue location for breakfast. Yes, that’s right. Cavallini’s Café and sometimes, wedding venue—runs this establishment. Enjoy the live train track that runs through the ceiling. And if you do NOT have vertigo….walk the circular stairway to the lookout where you can see downtown!! 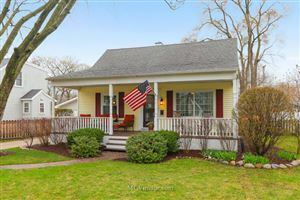 Tinley Park was as great stepping stone full of memorable adventures for our family and I so enjoy showing homes back in my neighborhood!